Happy New Year! Hope you all had a wonderful Christmas and are enjoying the start to 2015! It's always exciting to have a fresh new beginning. If you're like me, though...in with the new doesn't always mean out with the old, at least when it comes to home decor. I sure love taking the old and the worn out and making it "new" again! 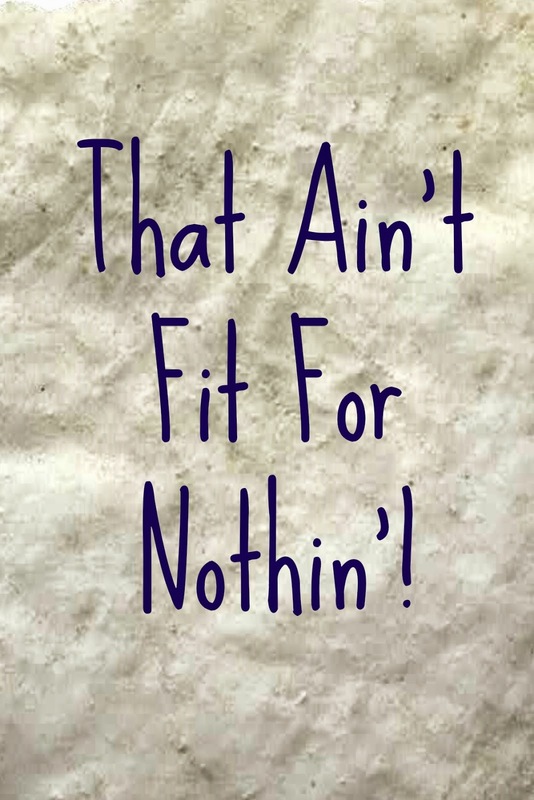 Have you ever had something in your possession that anybody else would label as, "Fit for nothin'," but you just couldn't pass it up because it spoke to your heart so much? I've been bad about that my whole life, especially when it comes to things that remind me of my mamaw and papaw's farm down in the East Kentucky hills. When I was a little girl, I filled an old emptied pill bottle with yellow dirt from their front yard, brought it home to Ohio, drew a map of the state of Kentucky, covered the map with glue, and coated it in that dirt. I kept that little dirt "masterpiece" in my room for years! Now most others would have said that old pill bottle of dirt was fit for nothin' for sure, but it made me smile every time I saw its contents on that little hand drawn map! Not terribly long before my mamaw and papaw passed away, I was down for a visit and happened to be in their old barn loft for some reason or other. Mamaw & Papaw's barn...if you look close, you can see the ladder that goes up to the barn loft. And low and behold, I happened across something that most folks might have said was...yep, you guessed it...fit for nothin'! In a dark old corner of that loft was a cardboard box with a handful of old plates: very chipped and worn, coated in years' worth of dirt, grime, and untellin' what all! Now the way those plates looked, they could have been ready for the dump, but I thought they were the neatest old things! I could just imagine all the wonderful southern mountain food that had once been served on them...soup beans, cornbread, gravy and biscuits, fried taters, turnip greens, and slices of dried apple stack cake... So I went in the house and asked my mamaw about them, and she ended up actually giving them to me! It was just a set of old farmhouse plates of hers that had grown too worn for further table use. I was tickled to death to have them...but Lord knows, even after a good washing, I wasn't about to go eating off of them after seeing the state they had been in. So here I was with a few heirloom plates that needed repurposed. Chippy and worn...but oh so loved! A couple of them, I just hung up "as is" on a plate rack. 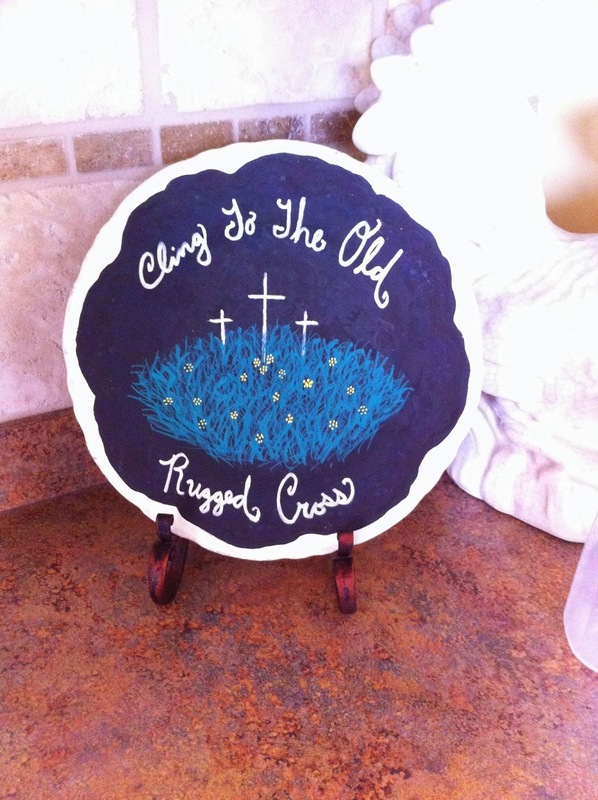 But my favorite repurpose was making one little plate into a chalkboard. I painted all but the outer edge of the plate with several layers of chalkboard paint (you can purchase chalkboard paint here), and it has been so fun using this plate to decorate for each season and holiday. Every time I see it, I think of my sweet mamaw, and the old barn where I discovered it...and that is what makes it so special. 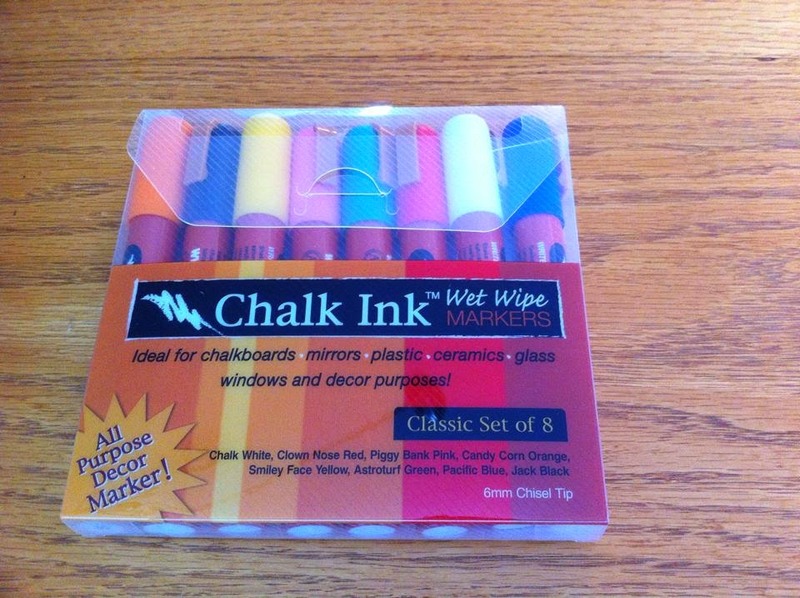 To write on the plate, I use chalkboard markers. If you have a chalkboard in your own home, these are a lot more fun than using just plain old chalk. You can purchase them here if interested. The brand of chalkboard markers that I use. Over time, it seems I have celebrated so much on this little plate from the hills...and I just love that something so old and "useless" has such a great new purpose now. Before I sign off from here, I've got one other repurpose to share with you. After Mamaw and Papaw had passed away, I happened to be back on their old farm on an occasion when Aunt "Oh So Sweet" was trying to clean some "junk" out of one of my papaw's old outbuildings. Steps into the old outbuilding that Aunt "Oh So Sweet" was cleaning out. She was forming a "for the trash" pile for some of the items. She was cleaning away when suddenly she appeared in the doorway of the old building with one of the rustiest items I have ever laid eyes on. She was ready to pitch it in the trash pile when she thought twice and asked me if I would like to have it. I said, "What in the world is it?" She explained that it was an old empty sardine can that my papaw had saved back for some purpose or other. Now my papaw sure did love his fish! I remember him eating canned Jack Mackerel for breakfast even! And he was notorious for standing in the local grocery store and shaking the cans of fish to see which ones were full of water and which ones held the most fish before he stuck his selection in the buggy. So the fact that he'd kept an old sardine can made me smile. And of course, since it tugged at my heartstrings, I said I'd take it! Mind you, this old can was nearly solid rust the whole way through complete with some scary sharp edges, and I had NO idea what in the world I was going to do with it! But I wasn't happy with just storing this old rusty thing away somewhere, so I knew I had to somehow make it over. 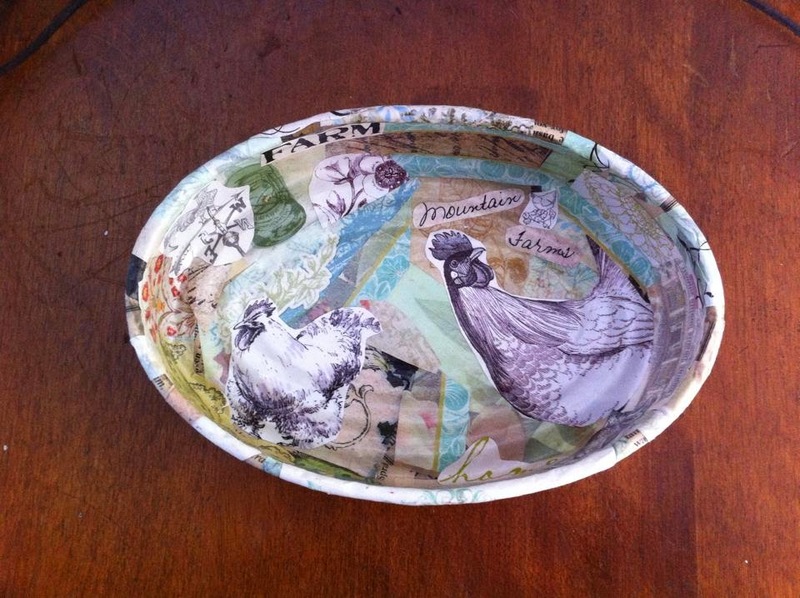 I decided that decoupage was the very solution. Since the old can had those sharp edges, I first covered it in a good heavy layer of newspaper strips adhered with Mod Podge. You can find Mod Podge in most craft stores, or you can purchase it here. 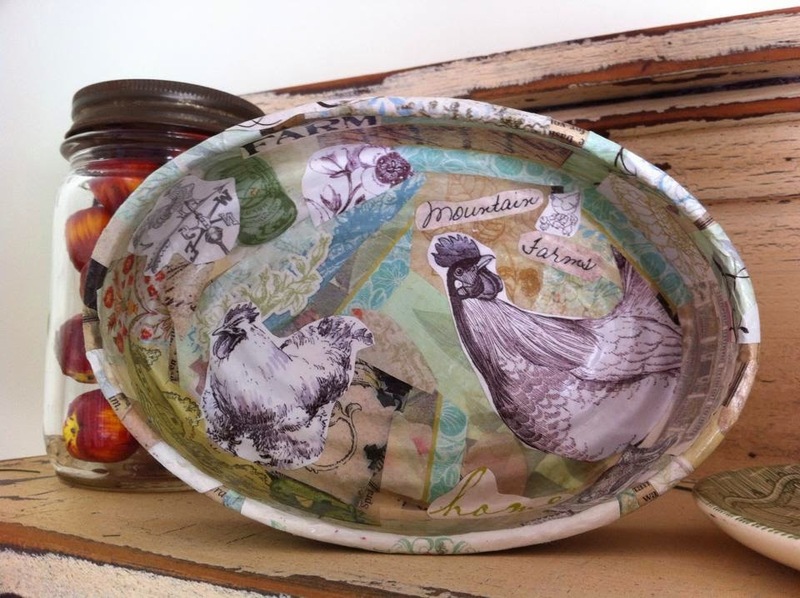 And if you have never decoupaged before, here are some good tips. 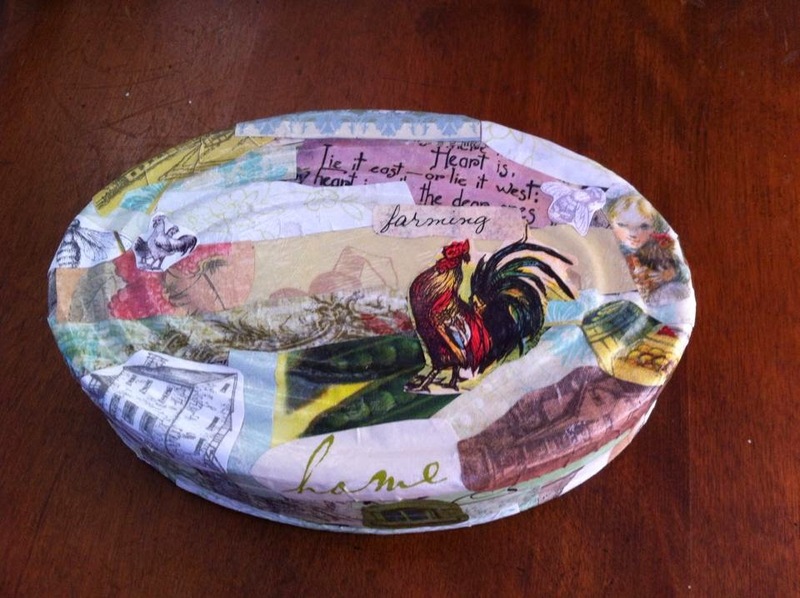 But basically, it's just covering over an item with pieces of decorative paper, coated in a glue such as Mod Podge. So after I got a good base of newspaper, I was able to find some lovely illustrations from several MaryJanesFarm magazines I had been saving. If you've never read MaryJanesFarm before, it is the cutest little magazine you've likely ever seen! 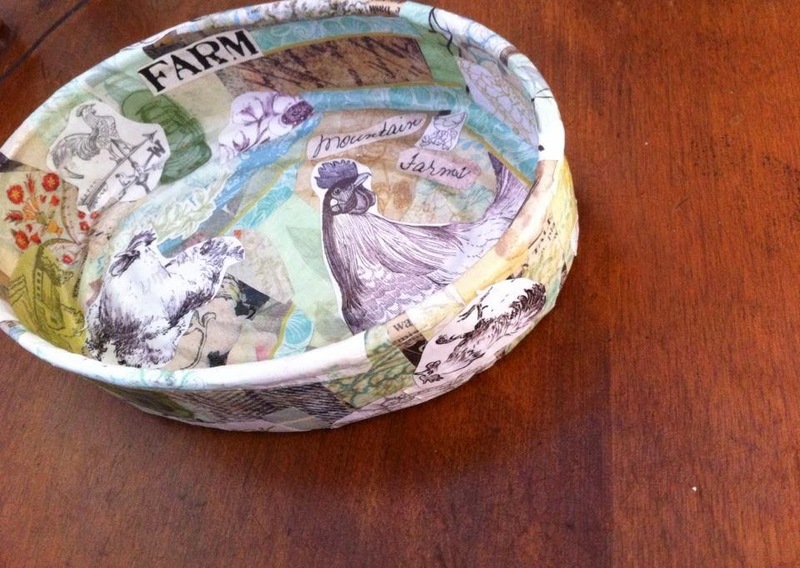 It is always filled with the most gorgeous, often vintage style illustrations (just perfect for a decoupage project), and it is chock full of wonderful content related to rural and farm living. You can subscribe to the magazine by clicking here, and check them out on Facebook here. 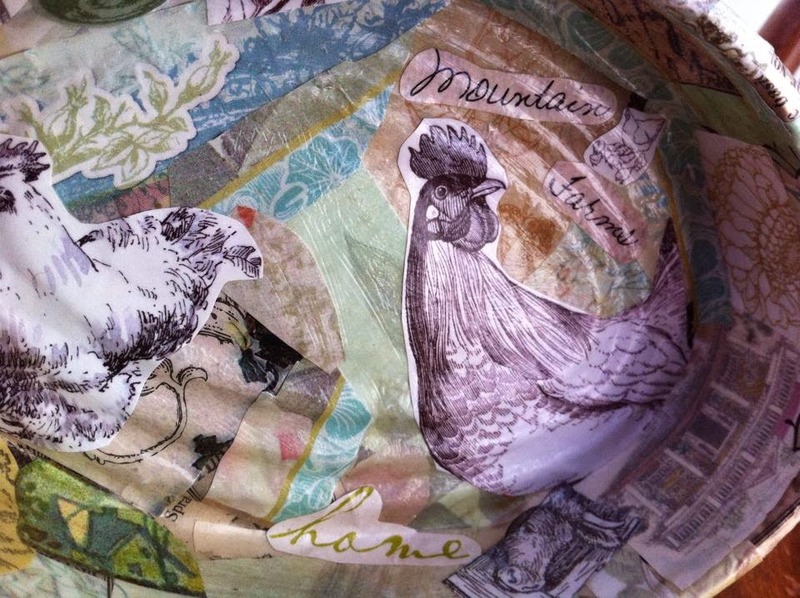 I selected a lot of images that reminded me of my Papaw, and covered the old sardine can with a bunch of chickens and rural scenes...and even the words "Mountain Farms" on one section of the can. I love how, despite the multiple layers of paper, the piece maintained it's original shape...in other words, if you know what a sardine can looks like, you would still guess this was one (it's just now a whole lot prettier). 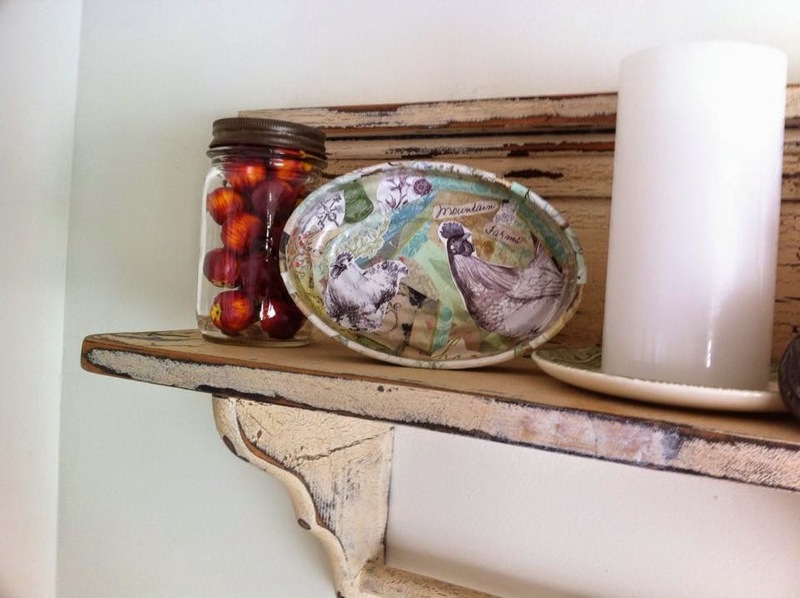 I keep the decoupaged sardine can up on a decorative shelf in my dining room where I can see it every day. It's a sweet reminder of my Papaw and a great repurpose for something that nearly went into the trash pile. Now if you happen to have an old heirloom just stored away somewhere because it's seen better days, hopefully this post has inspired you to pull it out and find some way to incorporate it into your home. If it's worth keeping, with a little repurposing, it can be worth displaying. And I think it's always better to surround yourself with things that have some sort of history and meaning to you, rather than just random store bought items. It's like gettin' a little warm hug from your mamaw or papaw every time you see these things! I'm looking forward to sharing with you even more posts with other Appalachian heirloom repurposing ideas in the future. In the meantime, I'd love to hear how you've incorporated items from "back home" into your own house. So drop me a line in the comments below, or head on over to the Appalroot Farm Facebook Page and post a photo or comment about your own Appalachian themed decor. I might even share some of your ideas in a future post. Blessings, and see you all back here soon! I love receiving your emails. Your pictures make me feel like I'm back in the mountains again.... Thank you. Aww! Thanks so much, Kathy. I'm glad you're enjoying the blog! Have a great rest of the weekend!